widgetsteam - widgets team playground - Posts tagged by "OOrganizer". It's been a long time since we released update for OOrganizer. Today we want to present totally new feature - to-do list. This is only the first and very basic implementation so any ideas are welcome! Have fun! 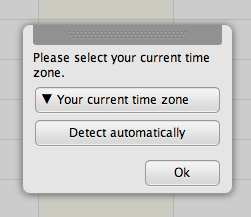 On first start you will be asked about your current time zone. You can choose it from the list or use geolocation for automatic detection. You can always change it in the new settings panel (click button next to the search input). Calendars synchronized with Google calendar will have special icon next to the name in the calendars list. By default synchronization is launched every 3 minutes. You can always change it in the settings panel. We'll provide more details about this release in the future posts. If you've some problems with specific functionality please let us know. We hope that you'll help us with fixing remaining bugs and improve quality of the final product. You can download widget from here. - events in month view can't be closed and aren't draggable. For quite a while we didn't write anything about OOrganizer, however it doesn't mean we weren't working on it. We were, and today we'd like to show you the brand new, still hot OOrganizer Alpha 6. We'd changed UI, improved navigation and added possibility to export calendars to Google Calendar. After we added import from Google Calendar feature a lot of people asked for adding export as well. It took a while but now we're ready to show it to you and we're asking for your help! We're interested in your opinions about OOrganizer, features which you find necessary to be added and, of course, bug reports. To export your calendar click on calendar name displayed in left panel, choose Export to Google Calendar and provide your account credentials - they won't be stored anywhere and everything will be sent over SSL. Some parts of th UI are still in a truly "alpha state" (e.g. the small popup calendar shown in "repeat until" field) however we're still working on things like that to end up with beautiful application and still we want to release development versions as often as possible. So have fun organizing your time and feel free to comment about everything you like and don't like in OOrganizer. I'm really happy to introduce you another version of our OOrganizer widget. If you want to check new version you have to have Opera 10.61 browser available on Desktop Team blog. Install OOrganizer with improvements described above. Please remember, that version is still alpha. How many widgets are you using more than once in the week? My Opera is a blog and photo sharing community with millions of members. Join now to follow widgetsteam's blog and get your own.